When Yahoos are not discussing new API’s, the latest Valleywag rumor, or the pros and cons of cafeteria food, the discussions go back to people than can’t park between the nice white lines of a parking lot. 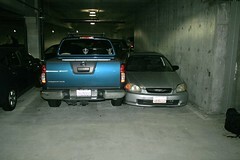 Today’s little victory is the Honda that happened to squeeze between the wall and this obnoxiously parked truck. Of course, a publicly displayed photo and humiliation via the internal mailing list follows. Accessibility Air France albumen amazon audi bad food Bucharest California chunnel dog Europe Eurostar fail florida Food france funny Heidi Iceland iphone. Istanbul John McCain lolz london overpriced Paris photoblog photography Politics Romania San Diego San Francisco stanford tacky train transitstrike Travel Turkey uk united states video walk Weetabix whine Yahoo! post-next , Proudly powered by WordPress.